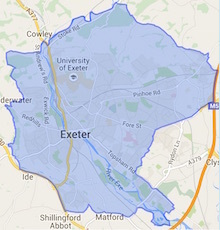 Here you can find the latest news and information about Exeter Conservatives, contact our Exeter and Devon councillors, get the latest news and see what we stand for in Exeter - low council tax, value for money and residents having their say. Keep an eye on our constant local news about what we are doing for Exeter residents under our 'News' Section; see our upcoming events and what we are doing in the next few months under our 'Events' tab, and more. You can also keep up to date with us on Facebook or Twitter.